Test your math skills and your memory in this interactive challenge. Twelve cards are arranged on the screen face down, and you may turn over two at a time. Each card has written on its other side a fraction or a decimal. If the two cards match, both are removed, revealing part of a picture underneath. To reveal the whole picture, you must clear all the cards - but that means you have to remember where each number is. 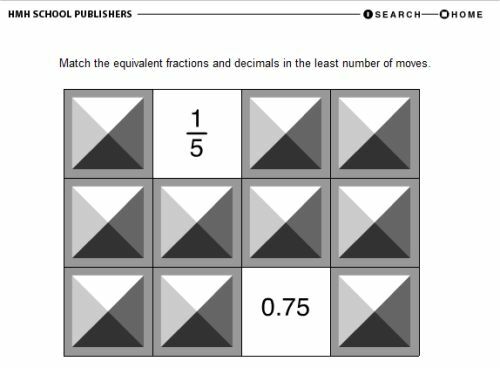 This is a puzzle that suits third and fourth graders, and has no timer so it makes for a relaxing way to approach the subject – ideal for learning at a pace suited to the student. What will the mystery picture show? Match those cards and find out!